Darlings! if life for you is over full with delights and reading my 12 captioned photos below is like receiving yet one more box of chocolates and just too much, skip to the bottom of the page and click the link to my photo essay of Vienna where you can dash through or savor as you see fit. The two Happy Husbands, T2 H2, Leo and Iory standing at the front door our Hotel, Zur Wiener Staatsoper, Vienna owned and run by hospitable Ungersböck family. We were right around the corner from the Opera House and the ultra-famous Hotel Sacher, of chocolate cake fame, and a hope skip and a jump to the main pedestrian shopping street, Karntner Strasse. This blow-out porcelain soup tureen is decorated with an abundant garden basket over-flowing with fruits, vegetables, flowers and garden tools, all surrounded by sheaves of golden wheat bending with the weight of their fecund ripeness. This sweet honey is part of the extensive collection of banquet and table settings: silver, porcelain, crystal, linen, etc. that belonged to the Habsburg Imperial household until the dissolution of the monarchy in 1918. These vast collections are on display in the Imperial Chancellery Wing of the Hofburg Palace, Vienna which was the seat of the Habsburg government for over 600 years. This gleaming white marble edifice is a newly cleaned wing of Neue Burg wing of the Hofburg Palace that houses the Ephesos Museum (Greek and Roman archeological artifacts from Ephesos, Turkey) and the Austrian National Library reading room. This part of the palace was constructed between 1881 and 1913 and as such was the last hurrah of the Hapsburg dynasty. The grandeur of the palace can only be described as “Imperial.” Every component part, sculpture, classical revival architecture and the immense scale of the building is all in the finest taste and exceptionally handsome. This wing façade faces the Berggren, a pleasant park with large specimen trees that can be comfortably viewed from the broad terraces flanking the palace. Now here is a tangle of bodies that perked my curiosity at the Kunsthistoriches Museum Picture Collection. The central characters are Odysseus of the Odyssey fame and the beguiling Circe, a powerful sorceress who turned all strangers to her island into animals by means of a magic potion. The surrounding menagerie is the unfortunate crew and companions of Odysseus as embodied in a number of beasts who signal their true identity by cuddling up to our hero. As you can see Circe is also attempting to make her moves on Odysseus who recoils in an attempt to disengage from her clutches. His reluctance, however, is perhaps disingenuous as he sojourned on Circe’s island for a year benefiting from her council as to how to navigate the perils ahead, all the while enjoying her “chummy” companionship. This painting is by Bartholomäus Spranger, a Flemish painter working in Prague at the court of Rudolph II Holy Roman Emperor of Hapsburg lineage, (1576–1612). I became aware of Spranger at the “Splendor and Eroticism in Imperial Prague” a special exhibit at the Met in New York City, winter of 2015, where a number of fleshy individuals of both sexes cavorted in various stages of undress and like the above painting were entwined in peculiar if not awkward possess. I am particularly intrigued by Odysseus’s complex and layered aegis or breastplate of two colors, chartreuse and purplish pink. Aegis comes from the Greek word aegis literally meaning goatskin and I mention it here because you can see how this “armor” is form fitting, accentuating various parts of Odysseus’s torso. Especially arresting is the Pinkish under layer that is seen covering the pectoral and hip region. I had to study this detail to discern why our hero had pink pecks, a sensitive erogenous zone on both men and women. Considering the element of eroticism attributed by the Met’s show to this artist I can only concur that yes, Spranger has created a highly charged picture that communicates a powerful sexuality on many levels, explicit and subliminal. In a more innocent tone we find these three chubby children engaged in arranging a flower garland or perhaps the two kids seated are draping the garland about the central fellow. Whatever their idyll is intended to be, their charming game contrasts and accents the formal balustrade of the terrace that surrounds the Neue Burg wing of the Hofburg Palace. Their position at the bottom of the stairs leading down into the Burggarten park acts as a transition from the sever formality of the Imperial palace above to the more natural landscape of the garden below. This charming sculpture which I assume was created at the time of the construction of this stretch of the Palace (1881 – 1913) draws its easy motion from the Rococo style of the mid-18th century. Our three friends have recently been cleaned in conjunction with the complete restoration of the Neue Burg wing now in process and you can see what a difference a day makes by the contrast between the almost black rusticated stone work of the foundation level of the palace above and the gleaming white cheeks of our little darlings, the same marble is employed in both instances. This painting, entitled Bacchanal is by Michaelina Woutiers (1617 – 1689). The Artist has painted herself into the scene (far right). She is turning away from a leering and scruffy character who is wrapped in a coarse animal pelt. He teases her cheek with his knurled fingers as Michaelina looks directly out of the picture at the viewer with a calm and alluring gaze apparently completely at ease with the antics of the procession before her. Center stage we see Backhaus, and yes this procession is intentionally theatrical – Bacchus was the God of wine, fertility of the harvest as well as theatre. The later evolving from drunken frenzies that were incorporated into ceremonies of ritual madness that evolved into Greek theatre – most especially as enacted in the farcical Satyr plays serving as emotional dynamic intervals between the longer tragedies. The near naked and highly sexual Bacchus, in a dazed and drunken state, is being carted in a wheelbarrow by a brawny Satyr whose cloven hooves spread with the weight of the recumbent god. An attendant in equal state of undress squeezes the juice of a cluster of grapes into his master’s slobbering mouth. Drunkenness in this context was seen by the ancient Greeks and Romans as a hyper aware trance state inducing prophecy, divination and sexual potency. Considering all of this, it is amazing that Michaelina, painted her version of Bacchanalian excess in the midst of the Counterreformation at a time of censure by the Catholic Church of all things secular when Rome struggled to regain its patriarchal hegemony over the Protestant reformation. Michaelina’s brazen nakedness exposing one breast and scantily clad in a pink sensuous tunic is equally surprising. To me she is declaring that she is perfectly at home and master of a “man’s world”. Her bravura stance is fully supported by her success as a painter of all major genres of her art (portrait, history, still life and genre) and by being the only female painter represented in the Imperial collections at the Kunsthistorisches Museum. At the Austrian Museum of Applied Arts I came across Gustav Klimt’s preparatory water-color designs for the mosaic wall decorations of the famous dining room at Palais Stoclet in Brussels designed by Josef Hoffman, the famous Vienna Secessionist architect and cofounder of the Wiener Werkstätte. This is one of the nine sections of Klimt’s designs and it shows the figure of “Expectation” who is standing in front of the “Tree of life” that spreads curly-cue branches over the whole design. The unique and peculiar hand gestures of this female icon are curiously enigmatic as are all the decorative patterns of the “Tree” as well as “Expectation’s” robe. Klimt’s designs were executed gold and multi-colored glass, ceramic and marble tiles, along with pearls and other semi-precious stones. These mosaic Friezes are highly inventive and whereas you may recognize some of his references and design presidents the whole work is dense with exceptional invention. Vienna is an unabashedly imperial city and nowhere is that more evidently than on the grand staircase of the Kunsthistorisches Museum where we find this lion rampant brandishing a shield with insignia of the Hapsburg dynasty. Can’t you just hear the ferocious roar emanating from this beast’s sharp toothed jaws? Once past the ferocious guardian lions on the staircase of the Kunsthistorisches Museum and inside the Imperial picture collection we find palatial galleries hung primarily with renaissance and baroque paintings. The rooms are all furnished with comfortable upholstered sofas facing in all directions and lavish architectural interiors that complement and enhance the art collections. 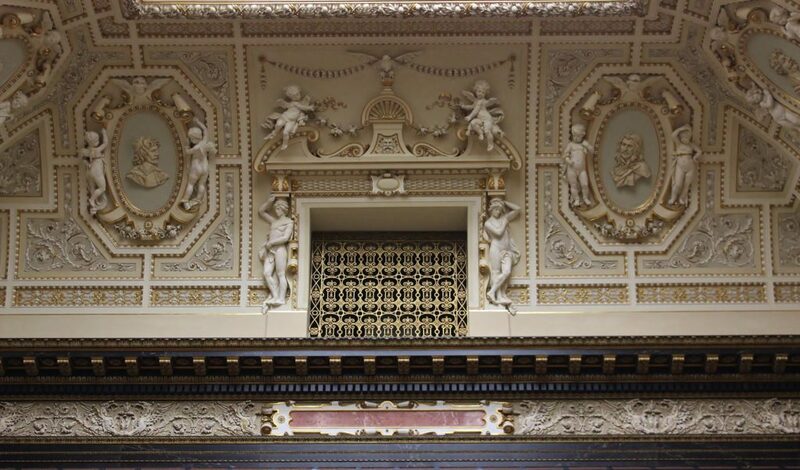 This is one end of the coved ceiling of one of the picture galleries of the Kunsthistorisches Museum. All the rooms of the galleries have similar ceilings and other appropriate decorations complementing and respecting the importance of the paintings. 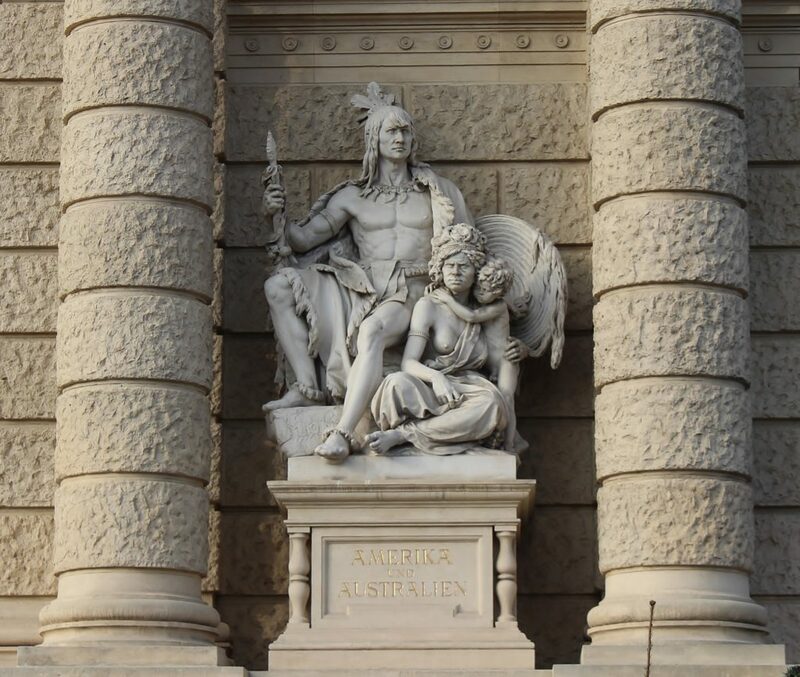 Accompanying the Kunsthistorisches Museum, across the Maria Theresien Plaz, is the Naturhistorisches Museum which has a large anthropological component to the collections hence this monumental statue representing the indigenous peoples of the American and Australian continents gracing the central entrance to the museum. This entry was posted in Vienna 2016, World Travel on February 16, 2017 by ioryallison3.